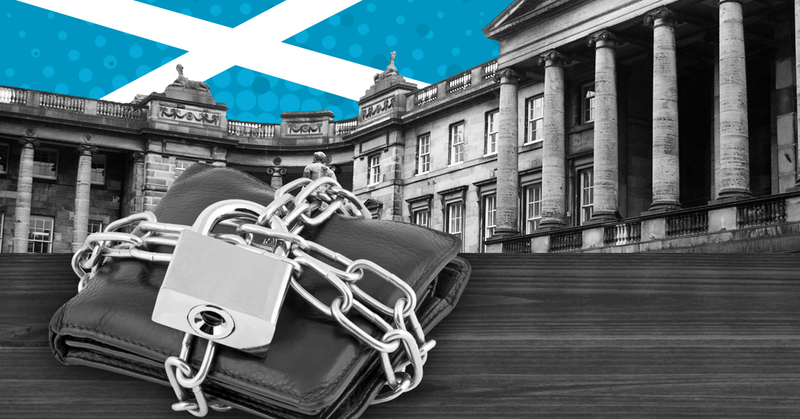 Are you struggling with council tax debt in Scotland? Council tax debt can place severe strain on both you and your family. The payments can quickly pile up if unpaid and the tactics that can be used to recoup this debt can be particularly harsh. One such tactic is known as wage arrestment. Under this process the council can ask your employer to take regular deductions from your wages to repay the debt you owe. If you are facing the prospect of wage arrestment, or are concerned about it being used to recover council tax debt, this article explains in clear terms exactly how it works and how it can be avoided. If you would like to speak to a specialist adviser about wage arrestment you can call 0300 302 1806, or complete the form on this page, to access free, immediate professional advice. By speaking to our advisors you can avoid the increasingly drastic tactics that are used to recover this debt. You place yourself back in control. There are no easy solutions to debt, but by taking positive steps you can avoid the most negative consequences. If you need to understand just how wage arrestment is used, and what you can do if you are at risk of having it used against you, then read on to find out more. If you are ready to take action and find a solution to your council tax debt in Scotland, then contact us today for advice and information. Call us on 0300 302 1806 or complete the form on this page. Wage arrestment is increasingly being used to recover council tax debt in Scotland. Under this tactic your employer is instructed to deduct money from your wages. Your employer must deduct an amount from your net earnings (that is your earnings after tax and national insurance) on each pay-day. This deduction must then be passed on to the council to pay off your council tax debt. Although widely used for council tax debt wage arrestment can be used for other forms of debt as well. Indeed it is part of a set of procedures that are collectively known as diligence against earnings. The important point to note here is that a conjoined arrestment can be used for two or more wage arrestments that are in place at the same time but not for an earnings arrestment and current maintenance arrestment. Need to speak to someone about wage arrestment? Our team of advisers are available to talk today. For a confidential, free consultation call us on 0300 302 1806 or complete the form on this page. When can wage arrestment be used? The normal method for paying council tax is in 10 monthly instalments. If you miss a payment, the council should send you a reminder giving you seven days to pay the outstanding amount. If you fail to pay the missing instalment after a reminder, however, you will lose your right to pay by instalments. In this case you will receive a final notice giving you 14 days to pay the whole amount outstanding for the remainder of the financial year. If this lump sum is not paid then the council can apply to the sheriff court for a summary warrant. This is a certificate from the sheriff court stating the amount of council tax you owe. You do not have to be told that the council are applying for a summary warrant. Likewise you will not have the opportunity to negotiate with the court before one is granted. You will only know about it the summary warrant when you receive notification of it in the post. The summary warrant is issued by the sheriff officers. It will state the amount due and who to contact to arrange to pay this. Your payments are no longer made to the council but to the sheriff officers. The amount due will have increased as there is an automatic penalty fine of 10% when a summary warrant is issued. At this stage you can arrange to repay the money at a rate that is comfortable for you. If you decide to do so make sure you come to an arrangement that you will be able to stick to. It is better to pay a little regularly over a longer period of time than to try to stretch yourself and risk missing payments. There is an additional fine if you fail to provide this within 14 days. In the meantime the council will obtain a charge for payment. You should get advice to check that these legal documents are correctly filled in because if your name or what you owe is incorrect the documents may not be valid. Also, when this charge for payment is served on you it must be accompanied by a Debt Advice and Information Package explaining your rights and encouraging you to go for advice. If this is not done any attempt to arrest your wages is illegal. You can check what the Debt Advice and Information Package should look like by downloading this PDF from here. It is not too late to act once a charge for payment has been issued. Before it expires you can still make arrangements to put in place a repayment plan. Doing this will prevent the actions listed above from being taken. There are many stages where you can take control of your debt rather than having it managed for you. If you need to speak to a skilled adviser for a free consultation call us on 0300 302 1806 or complete the form on this page. Who can receive a wage arrestment? The fact is that most of us can receive a wage arrestment: in brief, anyone who is employed (apart from serving members of the armed forces) can have their wages arrested. How much of my wages can be taken? There are strict rules about how much money can be taken from your wages, and also procedures in place to govern what happens if more than one creditor tries to arrest your wages. The amount taken depends on how much you earn. Any payments for commission, bonuses or statutory sick pay will be considered as part of your wages. You can get more advice about how much can be taken towards your debts by speaking to one of our specialist advisers. Need to know just how much of your wages may be at risk? Speak to a adviser today: call us on 0300 302 1806 or complete the form on this page. It’s unlikely that any employer is going to look favorably on what is an increased administrative burden. It is their legal duty to deduct whatever the courts insist from your wages. Your employer can also deduct a £1.00 administration fee every time the money is taken from your salary. Wage arrestment can be uncomfortable for you at work but it is not likely to be more than that. However, you may, as a condition of your employment, have a clause in your contract that states that wages arrestment is a matter for which you should be disciplined. This is often the case in work in, for example, financial institutions. In such circumstances you can apply to the court for a Suspended Attachment of Earnings Order. If you can supply compelling reasons why the wage arrestment should be suspended, you may be able to prevent it. One such reason may be dismissal or disciplinary proceedings at work. If you need advice about any aspect of wage arrestment contact us now to speak to our team of advisers. Call us on 0300 302 1806 or complete the form on this page.